How do you setup a self service kiosk for customers to browse through the cars you sell? Here is a challenge for a pilot program: Create a simple implementation for a self service “configurator” kiosk to place it on their showrooms. Users that come into the dealer showroom can start browsing. After a few pre-programmed conditions, a sales rep can approach them. The intention of this program is to minimize consumers sense of high-pressure sales environment. BlueKatana decided to implement this solution with a minimalist approach. This helps in deploying a solution that is as simple as possible. With this simple implementation, we were able to reduce cost and time-to-live. 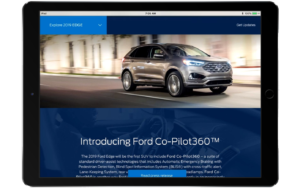 For each kiosk, we would setup a tablet inside a kiosk stand that would browse into the ” build you own vehicle” pages from the existing website. When the kiosk is idle, the setup automatically navigates to a different set of pages that showcase some of the vehicles on display. The end result of this project was a simple, yet powerful and very easy to deploy, setup and maintain. Kiosk stand. Manufactured for the tablet of choice. Made of metal and tamper-proof. Tablet. In this case, we selected an iPad Air by request. The same implementation would have worked with Android or Windows tablets. The existing website. We selected a few pages from the website that needed to be slightly re-styled to make better use of the available space on the iPad when used in full screen (also called Kiosk mode or Guided Access). A full screen browser alternate to Safari. Instead of configuring Safari to work full screen, we chose to use a third party app that is designed for Kiosk implementations. This allowed us to setup two base addresses for each kiosk: one for the build your own pages and a second address for the times when the kiosk is idle. BlueKatana was able to document a detailed procedure to follow whenever the program is taken to all dealer showrooms. 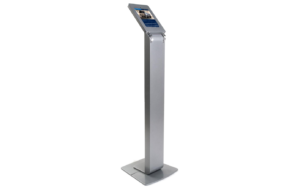 This process allows the dealer technical staff to deploy and locate the kiosks in strategic locations throughout the showroom. The steps listed here are a summarized version of the actual process. Open, charge and setup the tablets for first use. This implementation requires of an Apple ID per dealer. The dealer must create one if it does not have one. Connect the device into the dealer’s WiFi. Purchase the kiosk browser app. Setup the browser app to the two addresses preset for this particular device. i.e. The kiosk next to the latest Mustang would show media elements about the latest Mustang while idle. 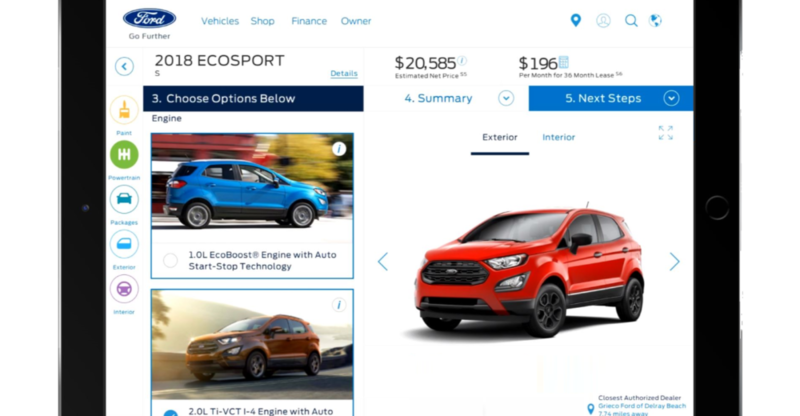 The vehicle configurator page would be preset to a Mustang setup, but allow vehicle changes if the customer chooses to do so. Setup iOS Guided Access mode with a password. Open the kiosk browser app. While in the Guided Access setup screen, disable motion detection so it does not auto-rotate. Disable other hardware buttons to prevent users from taking the iPad from guided access mode. Exit the Guided Access setup screen. Place the tablet into the case at the top of the stand, and plug it into the charger hidden within the stand. Place the stand at its designated spot on the showroom. For more information, please see the portfolio details here.